In a pinch, you can use a scarf to make an arm sling. Scarf slings also work well for Halloween costumes or for plays and skits. Use a square scarf for a sling or fold a rectangular scarf into a square first. Select any kind of scarf, from knitted wool scarfs to decorative fashion ones. 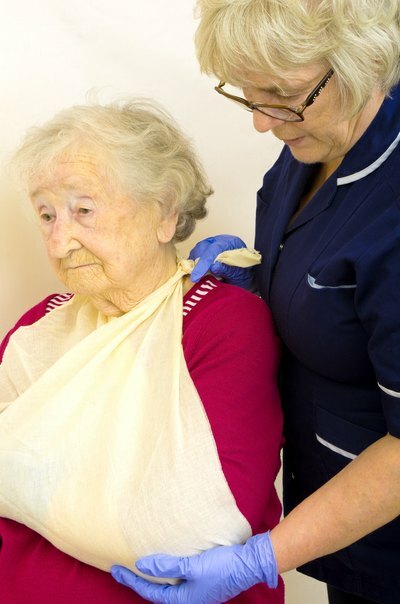 A scarf sling might serve as an interim solution to help an injured person keep his arm still until he can seek professional medical attention. Place the square scarf (or rectangular scarf folded into a square) onto a flat surface. Tie the upper left corner and the lower right corner together in a secure knot. Place the knot over the head of the injured individual so that the scarf drapes down over her chest in a loop and the knot rests on her shoulder or behind her neck. Gather the scarf loop together and pull it up in front of the hand of the injured arm. Slowly slide the hand and injured arm into the scarf loop. Continue sliding the arm into the loop until the entire forearm sits inside the scarf loop. Tuck the elbow and hand into the loop ensuring that the entire arm sits within the sling. If the scarf you are using is large and you have excess fabric on either end of the elbow or the arm, fold this excess fabric over the front of the arm and pin it to the sling with a large safety pin for extra support.